BANGKOK: The National Council for Peace and Order (NCPO) yesterday (Aug 27) denied growing speculation it had secretly agreed to allow ex-prime minister Yingluck Shinawatra to escape from the country ahead of the rice-pledging ruling last Friday (Aug 25). The NCPO yesterday came out to defend itself after critics suggested it stood to lose more than it gained if Yingluck was sentenced to jail for her role in the rice scheme. Critics suggested it turned a blind eye as she made her escape or even was complicit in her plans. The allegations against the NCPO have emerged on both social and mainstream media as well as by word of mouth and come amid media reports, quoting Pheu Thai sources, claiming Yingluck has arrived in Dubai and met her elder brother Thaksin. They also come as Cambodia’s strongman Hun Sen denied she had passed through his country. Yingluck failed to show up at the Supreme Court’s Criminal Division for Political Office Holders for the ruling last Friday, prompting expressions of surprise by the prime minister and a concession by his deputy that officials may have helped her flee. The regime has since come under fire for permitting a security lapse enabling her escape or being part of her escape plan. In response, NCPO spokesman Winthai Suvari said: “That was simply a personal opinion of those attempting to connect this with that, which should never happen as such speculation deals with accusations against a third party. It is not based on any proof or evidence but solely personal views. Yingluck’s no-show for the ruling in the dereliction of duty case is being dealt with in the normal legal and judicial processes, he said. A source in the NCPO said the NCPO wasn’t aware of and didn’t approve Yingluck’s escape from Thailand. The source said her escape would not benefit the NCPO, as shown by the harsh criticism it was now facing over her escape. “We instead believe there were several gaps [in security measures] exploited by Yingluck in her escape,” the NCPO source said. It is believed Yingluck and her team had planned her escape well ahead and waited for the right time to flee when security officials were convinced she would not run away, the source said. “We had always treated her with respect as she is a former female prime minister,” the source said. When she complained through the media about being stalked by soldiers snapping pictures of her, the military responded by relaxing its surveillance measures maintained on her, the source said. Political activist Srisuwan Janya, secretary-general of the Association to Protect the Thai Constitution, said he would today (Aug 28) petition the National Anti-Corruption Commission to launch a probe against Deputy Prime Minister and Defence Minister Prawit Wongsuwon and national police chief Chakthip Chaijinda for allegedly failing to prevent Yingluck from escaping. Mr Srisuwan said the public had good reason to believe that security authorities had allowed Yingluck to escape because before she disappeared, those authorities appeared to closely monitor her every move. 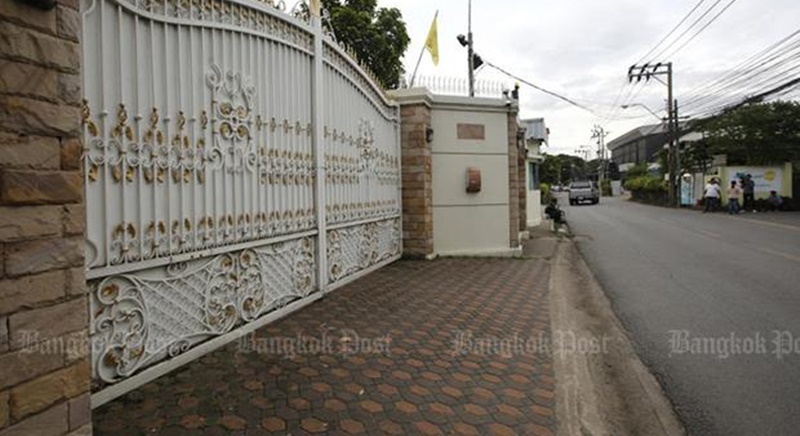 Maj Gen Chayaphol Chatchaiyadech, chief of Special Branch Bureau’s Division 4, said no search warrant for Yingluck’s house on Soi Yothin Phatthana 3 had been requested as investigators were still focusing on where Yingluck might have gone. The court issued an arrest warrant for her and rescheduled the ruling. The house remained shut yesterday with no one seen entering or leaving. According to the Khmer Times, Cambodia has denied allowing former prime minister Yingluck to transit through the country en route to Dubai after she fled the court judgement. Prime Minister Hun Sen told a meeting of 5,000 factory workers in Phnom Penh “there was no record of Ms Yingluck coming through Cambodia”. His comments on the issue were yesterday published to Facebook by Information Minister Khieu Kanharith, who attended the meeting at Koh Pich. “All airlines checked on Yingluck’s disappearance and alleged travel through Cambodia,” Mr Hun Sen said. Interior Ministry spokesman Khieu Sopheak said Yingluck would immediately be sent back to Thailand if she was found hiding in Cambodia. Back in Thailand, Wanchai Sornsiri, a member of National Reform Steering Assembly, said police would probably wait until the court hands down its ruling in Yingluck’s rice-pledging case on Sept 27 before they seek to have her passports nullified. Meanwhile, Democrat leader Abhisit Vejjajiva said the media had probably gone too far in saying Yingluck’s escape from the country marked the end of the Shinawatras’ influence over Thai politics. Mr Abhisit said he believes the Shinawatras will continue to maintain their political influence given the huge number of their supporters. "No one should attempt to give his or her opinions.." Move on folks, nothing authoritarian to see here. I'm always amazed at the ability to lie so blatantly. Curious as to how the junta  decided on which lucky member gets her home after it's seized. To deny, 'not true' or 'not knowing' are the usual comments the public has to swallow. Pity that the Kingdom not yet had submarines to intercept her.